Your Gateway to Modern Agriculture! The battle between farmers and Ukrzaliznytsia is going on. "Record Harvest Spells More Trouble for Conflict-Hit Ukraine" is a title of new Bloomberg's article. According to Bloomberg, as if Ukraine’s battered economy and political conflicts with Russia weren’t dismaying enough, a logjam on the country’s Soviet-era rail network is preventing some farmers from shipping bumper harvests in the breadbasket of Eastern Europe. A record supply of crops, from wheat to corn to sunflowers, is overwhelming the capacity of a money-losing rail monopoly that hasn’t added a new freight locomotive in almost five decades and can’t keep up with the pace of repairs on battered and broken grain wagons. Longer waits to secure transport are disrupting deliveries in a country that is one of the world’s biggest shippers of grain. “I asked for eight wagons for corn and was told that none were available,” said Yevhenia Fedoruk, logistics chief at UkrAgroCom & Hermes-Trading, an agricultural producer and trader in Ukraine that owns farms and storage facilities. “Sometimes our workers do basic welding on wagons -- better than rejecting a damaged car and waiting for a replacement indefinitely." While the amount of grain shipped by rail increased in recent years as Ukraine’s agriculture industry expanded, the number of rail cars fell because junked wagons weren’t replaced by the Ukrainian Railway Co., or Ukrzaliznytsya. This year, the sheer volume of crops during the harvest is compounding strains on the delivery system in a country that is among the biggest exporters of sunflower oil, barley, rapeseed, corn and wheat. Production of Ukraine’s seven biggest crops will jump to a record 85.8 million metric tons in the 2016-2017 season, according to the U.S. Department of Agriculture. 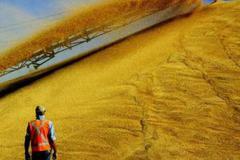 Grain exports are forecast by Kiev-based researcher UkrAgroConsult to rise 6 percent to a record 40.7 million tons, adding to pressure on railroads connecting fields to export terminals on the Black Sea. The country sees a grain harvest of 64 million tons this year, also an all-time high, Agriculture Minister Taras Kutovyi told Interfax. Ukrzaliznytsya, which controls rail lines in Ukraine and almost two-thirds of its grain wagons, failed for years to invest in replacing equipment, including grain hoppers, according to Chief Executive Officer Wojciech Balczun. The 46-year-old previously ran Poland’s biggest rail-cargo company. He took over in June with a mandate to turn around Ukrzaliznytsya, which lost about 16.8 billion hryvnia ($645 million) last year, after losing 15 billion hryvnia in 2014, as a war with pro-Russian rebels in the nation’s east devastated cargoes. In the three years through 2015, the company disposed of 192 grain hoppers that weren’t replaced, according to the Centre for Transport Strategies. As of March, eight more had been discarded this year. Each hopper can carry about 70 tons of grain. Repair work is chronically slow, with the company fixing just 18 of the 132 locomotives it scheduled for restoration in the first half of 2016, according to Balczun. About two-thirds of Ukrzaliznytsya’s 11,650 grain wagons are already operating beyond their intended lifespan. That will rise by 1,690 next year and 2,055 in 2018, the company says. A minimum of 5,000 new hoppers a year are needed, according to Volodymyr Klymenko, head of the Ukrainian Grain Association. As a result, demand is at least 30 percent higher than supply, even before an expected increase in exports, said Serhiy Vovk, a director at the Kiev-based Centre for Transport Strategies. Balczun wants to raise prices he says are too low, given the investment needed to upgrade the railroad, though the government hasn’t indicated it would support an increase. Corruption at the company remains “a huge problem,” Balczun has said. The cost of hiring a hopper is about a quarter cheaper than in neighboring Poland, according to Vovk. Fixing the company’s troubles may not be easy. While parliament is selling off some state assets to raise cash, it enacted legislation to permanently ban a sale of the money-losing rail monopoly even as the Ukraine’s creditors demand budget cuts and the economy struggles to emerge from two years of contraction. Infrastructure Minister Volodymyr Omelyan told lawmakers in Kiev in September that Ukrzaliznytsya won’t increase cargo tariffs in the near future. However, he promised in e-mailed comments to work with the company to reduce turnover of hoppers and crack down on any corruption by rail workers. Balczun warned the government this month that some at the company are betting he won’t last in the job, and that once he’s gone, reforms will be discarded. Still, he is pushing ahead. Ukrzaliznytsya will invest 26 billion hryvnia in 2017, with increased spending on repairing wagons and locomotives. The CEO has hired a fellow Pole to overhaul procurement, and the company agreed to start joint production of locomotives in Ukraine with Bombardier Inc.
“We’re not planning to buy hoppers,” Balczun said in an e-mailed response to queries. “We see opportunity for more efficient use of cars by our clients” and more privately operated wagons, he said. For now, agricultural producers are getting impatient. Oleksiy Vadaturskyi, founder of Mykolaiv, Ukraine-based Nibulon, one of the country’s largest grain and oilseed producers, said his wagons get stuck in line waiting for state-operated cars to load and unload, turning a round trip of three days into an eight-day crawl. Land Moratorium is Prolonged.Victory or Treason? © Ukrainian Agrarian Confederation, 2006-2019.